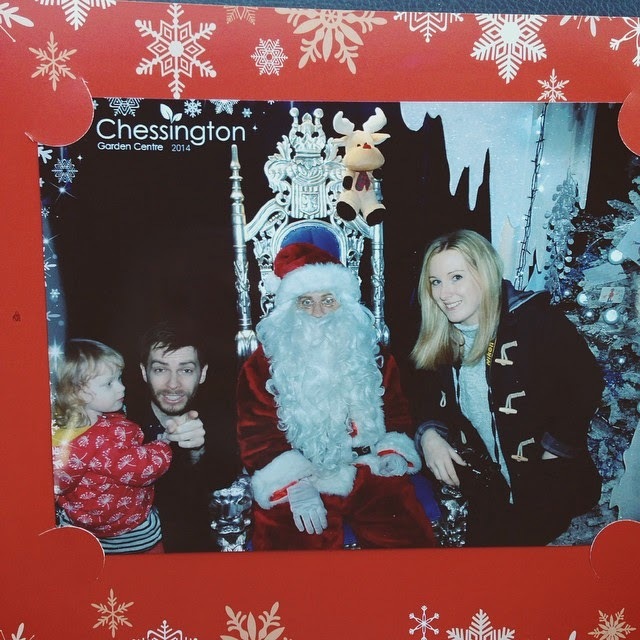 On Saturday we took the children to see Father Christmas! It was at Chessington Garden Centre in Surrey, and boy was it amazing!! A little pricey (£11 per child and £3.50 for each adult) but well worth the money. You walked through a magical winter wonderland to get the the big man himself, which included themes such as Narnia and Alice in Wonderland! I tried to get some photos of it all but to be honest, I was a little too excited myself... :) It was pretty incredible. We were obviously a little unsure of how Alice would react to Mr Christmas, as last year resulted in some tears (and screams), but she was actually ok! She told him what she wanted for Christmas (one of those moments when you go... please say what we've already bought you! And thankfully she did!) and even high fived him on the way out. Of course, the one thing she wouldn't do was look at the blooming camera at the end, but you know. You can't win them all! haha! This will always be one of my fav family photos! She looks so confused! Haha!